Tends to live full of spirit and without compromise. 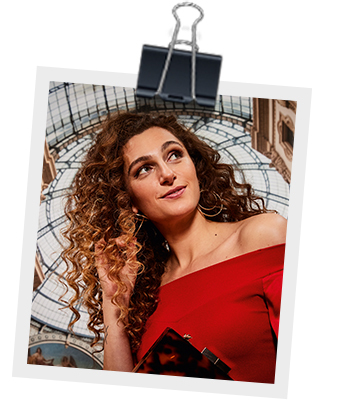 “Francesca – Milano” is the Mona Lisa of the city, the exciting flirt on the piazza, the dolce vita of the south – beauty to bow down to. Pizza & Pasta, da Vinci & Verdi, Family & Friends, Laughing & Crying. “Francesca – Milano” embodies a mixture of the traditional and the modern in a unique way. In fashion, in interiors and in design, “Francesca – Milano” stands for hot trends which consistently captivate with exclusive design, colour and form.. Now. Not later! With perfection in every detail. The typical character “Francesca” represents the trends from the metropolis of Milan. We’re taking you to the trendy metropolis of Milan. “Francesca” tells you something about her life and her idea of a perfect interior. Everything here is about fashion, design and lifestyle. You won't find yesterday’s trends here – just tomorrow’s. And that goes for “Francesca’s” home too. Her wall design in particular is elegant and unique, in modern graphic patterns with gilded details. She brings the whole look together with carefully selected decorative elements – and the Milano look is “perfecto”. She also likes to invite her whole family to her home, because there is nothing better than sitting together with pasta and red wine and sharing hearty laughter. Some say “Francesca” is a bit too feisty and temperamental, but she merely knows exactly what she wants! Milano is all about joie de vivre and living in the moment, and “Francesca” will be showing you this over the next few weeks. 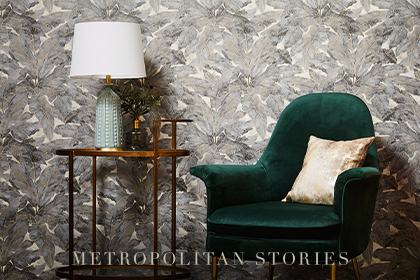 “Used look” meets modernity – “Francesca – Milano” wallpapers have an exclusive design of an uneven, coarse background – combined with a metallic-shimmering line pattern. Available in different colour shades, they skilfully represent the latest trends. and transform it into a real eye-catcher.